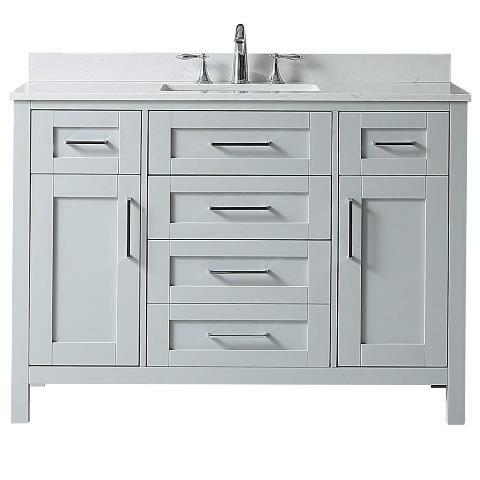 Redesign your bathroom starting with this OVE Decors Riverdale Vanity. This vanity features a transitional design, merging the best of traditional and contemporary styles, creating a timeless look. It features a freestanding construction, which takes up less space. 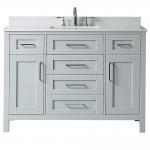 With a wooden build, this vanity offers a timeless and classic look. It has a rectangular undermount sink, fastening under the counter, which makes it possible to swipe liquids from the countertop straight into the sink. With a white vitreous china design, its sink is corrosion-resistant and simple to maintain. Vanity Top Thickness: 0.8 in.